Phuntsholing 1N, Thimpu 2N, Punakha 2N, Paro 1N.Air Fare/Train fare. On arrival at Bagdogra Airport & transfer to Phuntsholing - The Gateway of Bhutan by Road from India. Phuntsholing is a thriving commercial center on the northern edge of the Indian Plains. On arrival check in at the hotel. Overnight stay at Jaigaon/Phuntsholing. Thimphu the capital of Bhutan is a home of Royal family. After breakfast visit Tashichho Dzong, the main secretariat building which houses the throne room of his Majesty,the king. View of the Thimphu valley from BBS Tower is very captivating and will prove to be the perfect introduction to Thimphu. Some of the sites of religious nature are National Memorial Chorten; built in 1974 it was raised in the memory of third King. Next visit one of the oldest monasteries in the valley-Chang Gangkha Monastery. The nature and wildlife lovers should not miss a visit to National Zoo which also houses national animal takin. National Library (collections of holy scripts) & in the evening visit Buddha point. Overnight stay at Thimphu. After breakfast drive to Punakha / Wangdue Phodrang (4,300 ft.), via Dochu-La-Pass (10,170 ft.). Continue towards Punakha visit Chimi Lhakhang - The Temple of Fertility built in 15th century. Also visit Punakha Dzong. On arrival check in at the hotel. Evening free for leisure. Overnight stay at Punakha. Visit the Ta Dzong, once a fortified lookout tower that is now the National Museum. Then walk down the trail to visit the Rinpung Dzong meaning "fortress of the heap of jewels". Next visit Kichu Lhakhang, the oldest temple in the country. From there you will be taken to the Drugyal Dzong (Bhutan Victory Fort), which was built in 1646 to commemorate Bhutan's victory over Tibetan invaders during the 1600s. On a clear day you can see Mount Jumolhari, Bhutan's second highest mountain at 7,314meters.. Evening is free for leisure. Overnight stay at Paro. After breakfast hike to Taktsang (Tiger's Nest) Monastery, which is Bhutan's most famous monastery situated at 3180 meters. 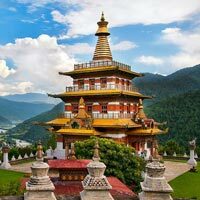 Guru Rinpoche (the great spiritual master) is said to have flown on the back of a tigress to meditate in a cave where Taktsang Monastery now stands. 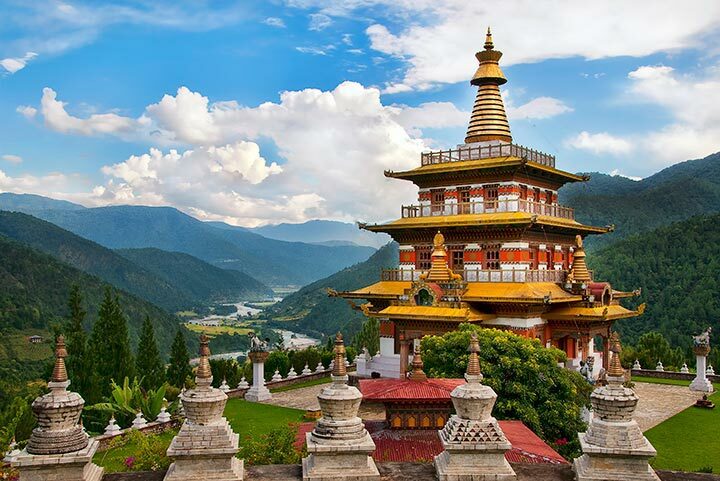 The monastery is perched on the edge of a steep cliff, about 900 meters above Paro Valley. Overnight stay at Paro. After breakfast check out from hotel and drop at Bagdogra Airport for your onward journey.